A Montgomery County Circuit Judge ordered Lloyd Hall to be released from prison on Thursday – immediately – vacating a life-without-parole sentence and ending an injustice that had persisted for 34 years. 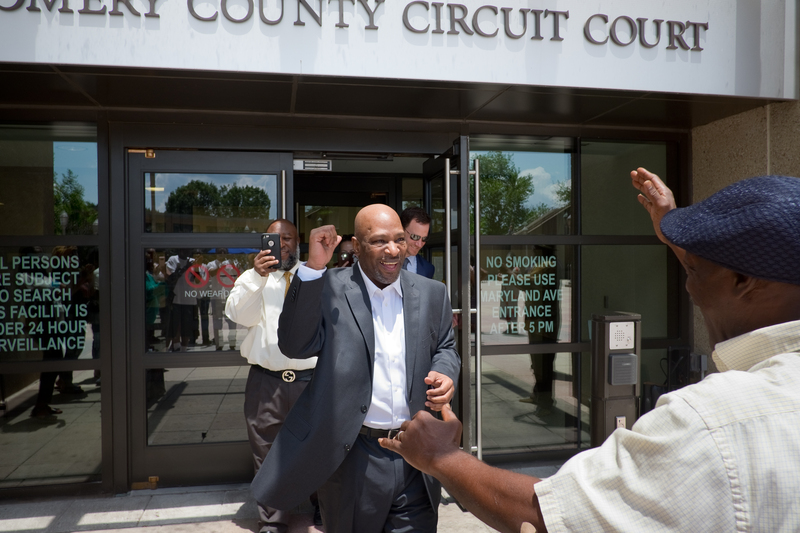 Hall walked out of the courthouse in a new black suit around 1:15 p.m., and was greeted by a cheering crowd of family and supporters. Hall had been convicted in 1984 for burglary and related offenses. Because he had three prior convictions for burglary and housebreaking, he was sentenced to mandatory life in prison under Maryland’s “three strikes” law. The law considered Hall to be a violent re-offender – even though none of his predicate convictions encompassed any acts of violence. Rather, Hall had struggled with drug abuse and had committed a string of petty offenses to support his habit. At the age of 29, Hall was condemned to live out the remaining days of his life in prison. In a cruel twist that made his fate even more difficult to accept, Maryland soon thereafter changed the law that classified Hall as a violent offender. After Hall’s sentence was imposed, the Legislature changed the “three strikes” rule so that Hall’s predicates were no longer considered crimes of violence. But, for Hall it was too late. He had no way to get back into court. Many years later, Hall came to us seeking help. He was supported by the tireless advocacy of his sister, Carolyn Williams, who had pledged to him many years ago that he would not die in prison. After research and investigation, we filed a post-conviction petition raising a single issue: that Hall’s trial counsel, back in 1987, had been constitutionally ineffective for failing to file a motion seeking a modification of Hall’s sentence. If trial counsel had filed that routine motion, we argued, Hall would have been able to get back into court and obtain a new sentence in light of the changed law. Rather than confront the State with our petition in open court, we decided to negotiate with the Montgomery County State’s Attorney’s Office, and persuade them that relief was merited. Hall had been a model prisoner, he had a supportive family, and he had developed a detailed plan for what he would do upon release. After extensive negotiation and vetting, the Montgomery County State’s Attorney – to his credit – agreed with us that Hall should be granted the relief we were seeking: his immediate release from prison. The final step was to convince the court to honor our bargain. On July 12, 2018, we appeared before Montgomery County Circuit Court Judge Ronald B. Rubin and presented our arguments. In an hour-long hearing in a packed courtroom, Judge Rubin heard from witnesses, including forensic social worker Rebecca Bowman-Rivas, considered the appropriate law, and issued his order. “I order you released, forthwith,” Judge Rubin said.